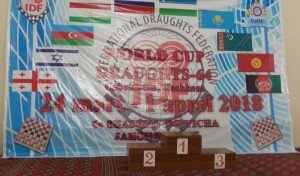 International Draughts-64 Tournament among boys and girls in the age groups up to 14, 11 and 9 years on the prizes of the President of Uzbekistan Draughts Federation Yunus Amindjonov for the first time was held from March 24, (arrival day) till April 1, 2018 in the capital of Uzbekistan, Tashkent together with with the 2nd Stage of World Cup 2018. The prize fund of the tournament was 1000 euros. See results. 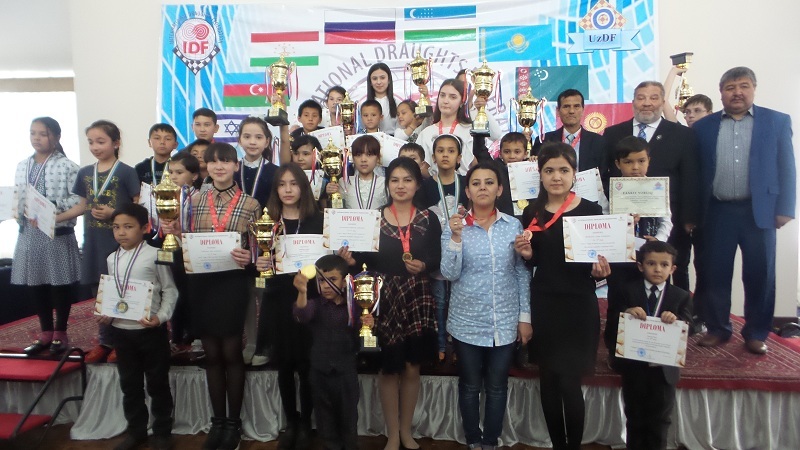 31-03-2018 Classic program of the International Draughts-64 Tournament among boys and girls in the age groups up to 14, 11 and 9 years on the prizes of the President of Uzbekistan Draughts Federation Yunus Amindjonov ended. Tournament was held in the framework of the 2nd stage of the World Cup. Competitions in all programs were held separately among boys and girls in age groups up to 14, 11, 9 years. More than 90 players from Uzbekistan, Kazakhstan and Russia took part in the competitions. See results. Closing of the classic program took place today. See photo. 27-03-2018 Classic program started. See current results. Closing of Blitz and Rapid programs was held at 17.00. See photo. 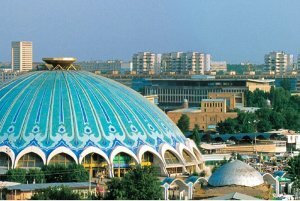 And tomorrow, all participants of the competition go to a bus excursion to ancient Samarkand. 26-03-2018 Rapid program in all age groups was held today. See results. 25-03-2018 Blitz program started at 14.00. 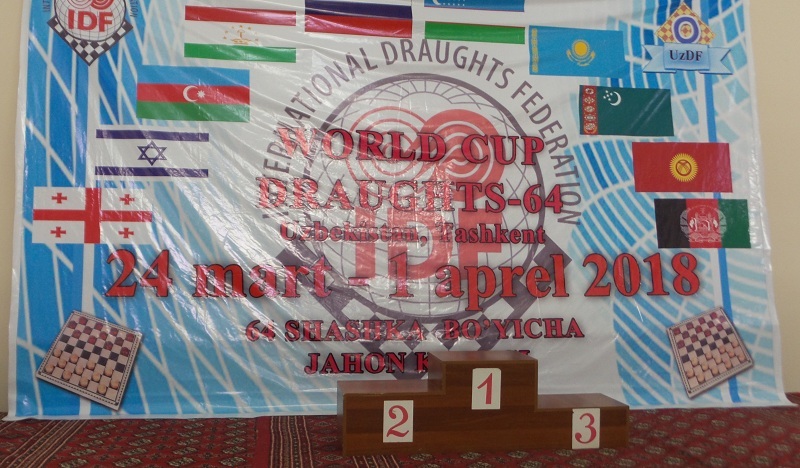 Competitions in all programs are held on the system of micro-matches from 2 games in the classic Russian draughts. 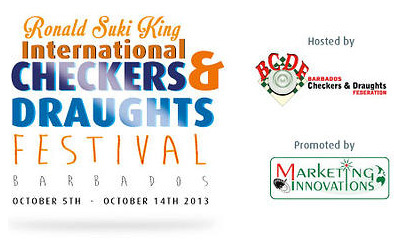 Separate tournaments are held for boys and girls in age groups up to 14, 11, 9 years (6 tournaments). See results. 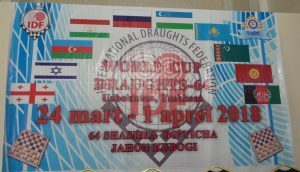 25-03-2018 Today in Tashkent, the capital of Uzbekistan, the 2nd Stage of the World Cup 2018 in draughts-64 – International competitions “Uzbekistan-2018” and International Draughts-64 Tournament among boys and girls in the age groups up to 14, 11 and 9 years on the prizes of the President of Uzbekistan Draughts Federation Yunus Amindjonov started. More than 90 players from from Uzbekistan, Russia and Kazakhstan take part in the tournament. Opening ceremony was held at 10.00. 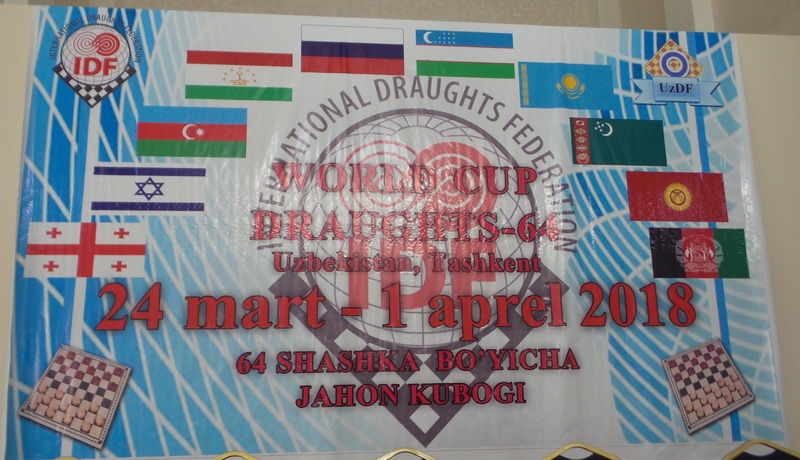 Participants of the competitions were greeted by the President of the International Draughts Federation (IDF) Vladimir Langin, Vice-President of the International Draughts Federation, the President of the Draughts Federation of Uzbekistan Yunus Amindzhonov, the representative of the Ministry of Sports of Uzbekistan.